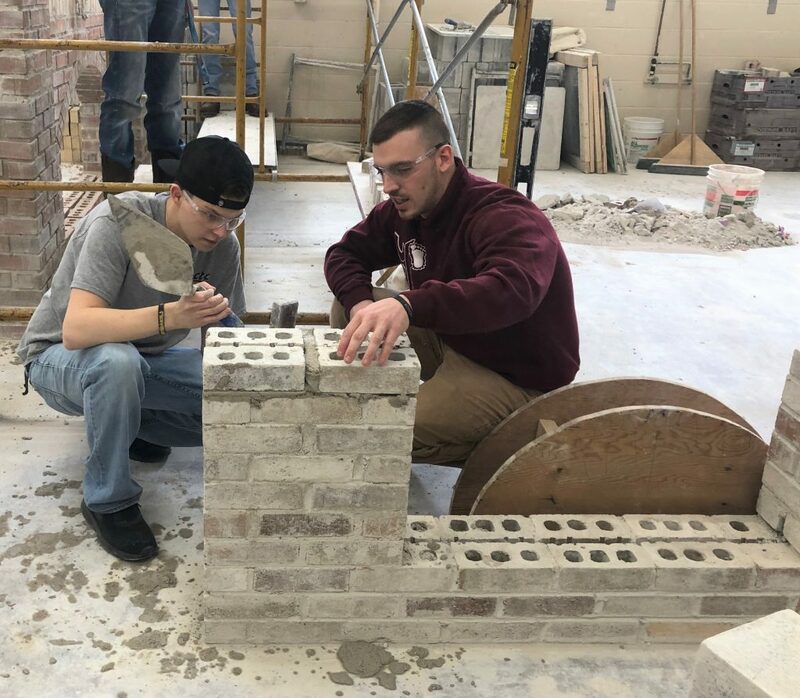 The Masonry and Building Construction Technology Program prepares students for careers in the masonry construction field, apprenticeships, or post-secondary education. There are two elements to the program. The hands-on component of the program provides instruction on block, brick, stone, glass block, concrete, and plastering along with building walls, chimneys, arches, fire-places, and other structures. The theory component of the program includes mortar, chimneys, foundations, fireplaces, arches, estimating, blueprint reading, and safety. Students will complete individual and group projects, which will include written exercises. 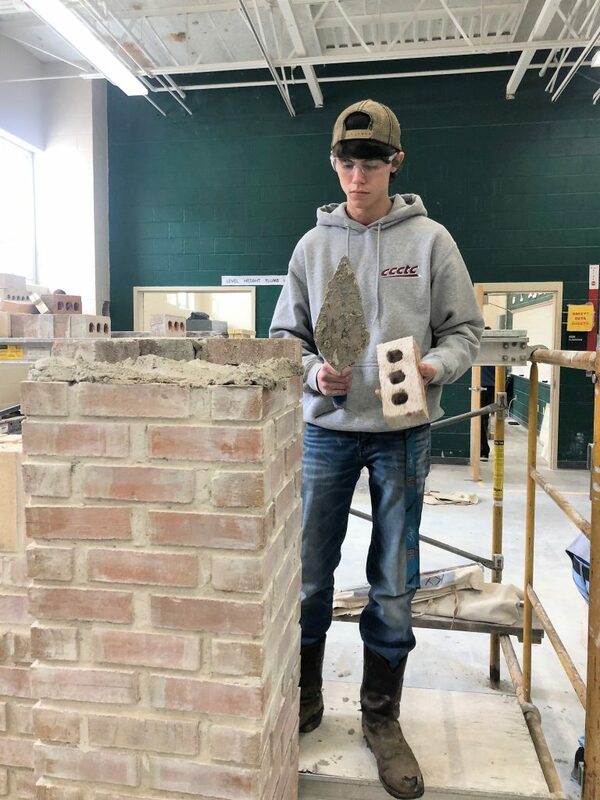 Students are trained in all phases of masonry. The course offers hands-on experience with block, brick, stone, tile, and concrete. 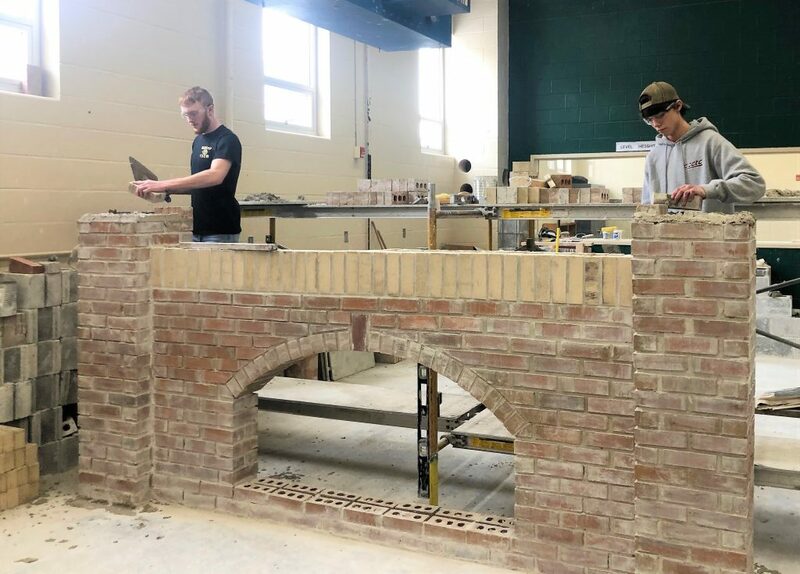 Students build walls, piers, panels, fireplaces, arches, steps and other related projects. Students also do many live projects for different community organizations such as Habitat for Humanity and other charity organizations. They also do a lot of live work onsite at the CCCTC. Theory consists of learning about footers, identifying different bricks and blocks, waterproofing, bond estimating, blue print reading, and safety. The course is designed by area contractors and bricklayers to create the finest of apprentices. Work in masonry is a combination of physical and mental activity. Skills needed to master the trade include good physical condition, coordination and dexterity. Lifting heavy objects is an integral part of masonry. Also a very good math background and problem solving skills are required to meet the needs of the job. Measuring, calculating estimation materials, and reading scales on blueprints are just some of the applications of math that are necessary. The bright future in Masonry is high pay and diversified areas in which to specialize. Masonry is a great trade you can use forever. Masons have to be artistic and creative to be able to create beautiful things; for example, tile in a bathroom, bricks in homes, stone used in churches, concrete sidewalks, plastering, terrazzo, marble work, and restoration of older buildings and monuments.